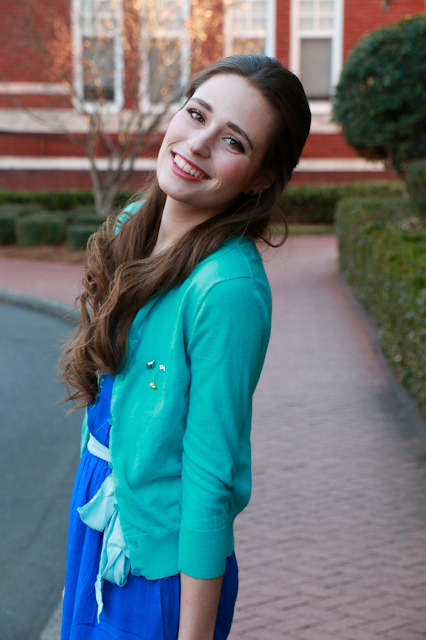 Welcome to my second annual fashion post link-up on Southern Belle in Training for NPC Badge Day! (Check out last year's post here!) As y'all know, one of the highlights of my college experience has been getting to be apart of Greek life at my school. I'm a sister of Alpha Delta Pi, which is one out of the 26 Panhellenic national sororities. Every year, the National Panhellenic Conference (NPC) hosts a day when women of all sororities- both collegiate members and alumni, are encouraged to wear their organization's pins and pin attire, and to celebrate being apart of the larger women's Greek community! As a sister of ADPi, I take so much pride in wearing the diamond shaped badge of my sorority. I know that sisters of other sororities also understand the significance of wearing their own pins! In honor of NPC Badge Day and to promote Greek unity in the blogging community, I decided last year to host an annual link-up where bloggers can share pin-attire inspired fashion posts, or other posts related to Greek life on NPC Badge Day. :-) Please feel free to join in the fun and link-up a relevant post!! I'm leaving the link-up open through this week. 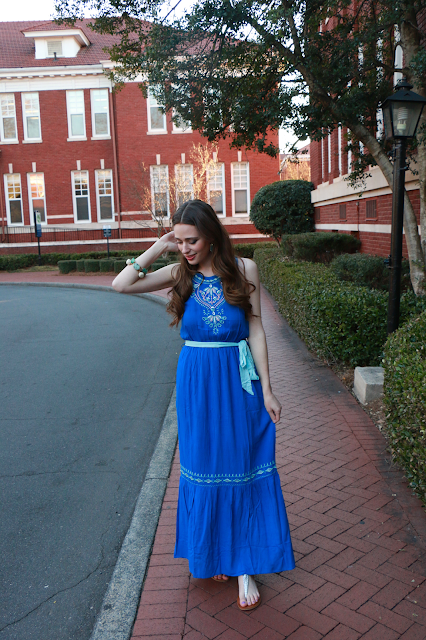 This gorgeous blue maxi dress would be perfect to wear to church on Sunday morning, for lunch with friends, and it's also comfortable enough for a day of homework afterwards! Later that day for chapter I would change up my accessories a little bit, and add a cardigan and pin to make it a little more conservative. 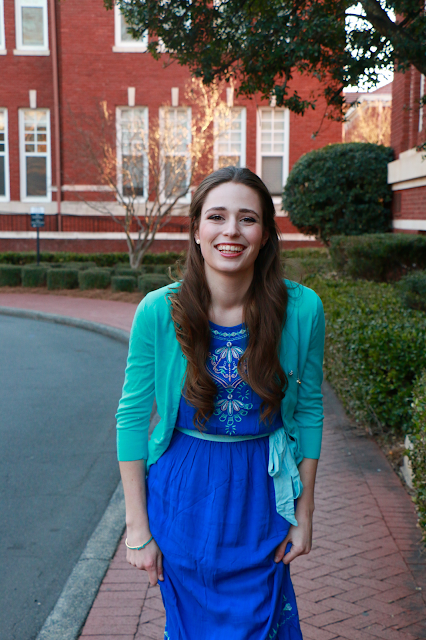 This outfit is transformed from afternoon casual to pin attire appropriate! 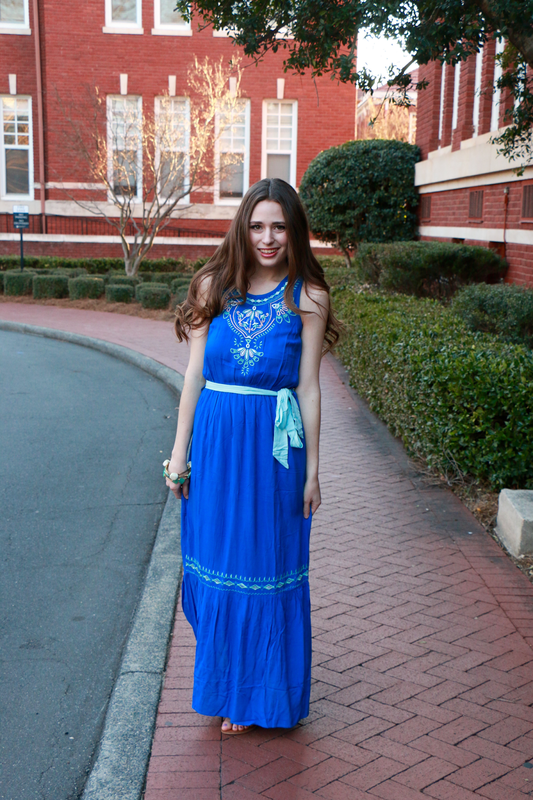 Pink Blush is an online boutique that sells very fun and trendy fashion and accessories! (They also have a huge section on their website of maternity clothing- perfect for if you or someone you know is expecting!) I styled a gorgeous top from them in Saturday's blog post, and the dress that I'm wearing here is from Pink Blush as well. They are generously giving away a $50 gift card to one lucky Southern Belle in Training reader! This giveaway will run through Tuesday, March 15th, 2015. Okay total hair envy! But seriously you have gorgeous locks! That outfit is super cute too! Gorgeous colors!! I always love when I'm able to transition my outfits from day to night. Gorgeous Annaliese! I can't wait to rush in college! I really really need that dress, and your hair is ON POINT! Love, love, love that dress so much-that color was made for you! Such a great way to share your letters for this fun day! Okay seriously that dress looks gorgeous on you, it's a perfect church and chapter outfit! That dress is SO cute!! What a fun post! Love your look and loved this link-up! 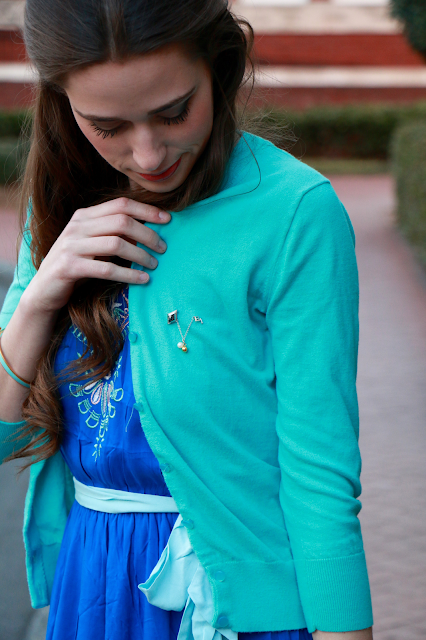 It was so fun to reminisce on my sorority days and celebrate National Badge Day! This is such a fun link-up! I loved participating, I miss my sisters so much! You look great! 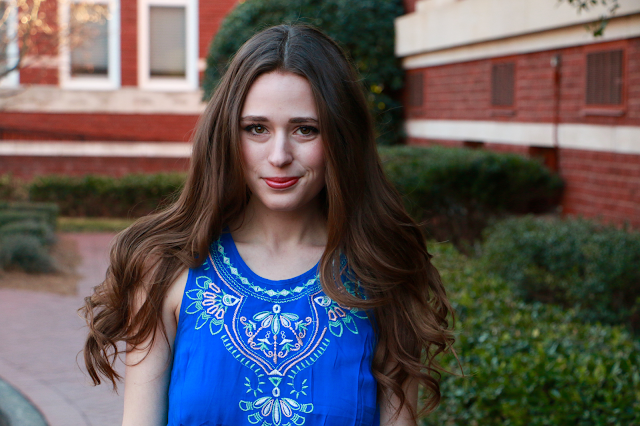 Girl, your hair is fabulous in these photos! I also love the dress on you! 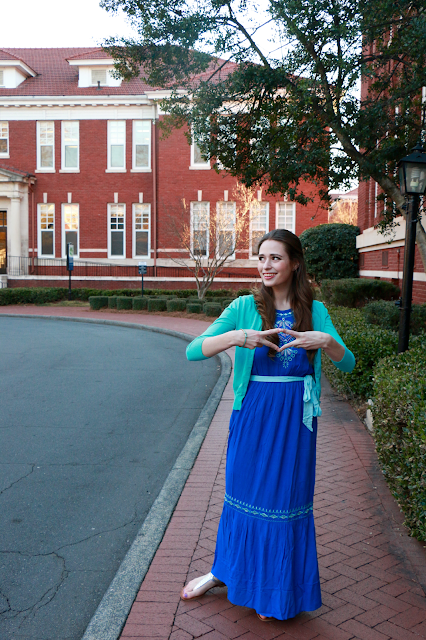 In college, it was my favorite day to dress up and proudly rep my sorority! I still treasure those days. Such a beautiful dress!! It can totally be dressed up or down and the colour is totally flattering on you! You are so photogenic, just gorgeous!! Love the top of your dress! Those pretty hues of blues are gorgeous. I love the dress, and I'm so happy that you've had such a great experience with your sorority. It was a pleasure to meet you earlier this week! Blue is so your color, gorgeous girl!